If you've ever seen your baby take on a blue cast, you know how scary this is and it still warrants a 911 call. But according to new research, your baby could be totally fine. If it's happened to you, you'll never forget it: That time you saw your baby take on a faint blue cast right in front of your eyes. It's a sight that can make time feel like it's come to a standstill. It can make your heart stop and expose you to an level of fear you didn't even know was possible. You might think it's something terrible and life-threatening when this happens, but that may not always be the case. According to new research, this effect could be nothing to be afraid of—it might even be normal...or common. The American Academy of Pediatrics has dubbed these unexplainable events, like when a low-risk baby briefly stops breathing, BRUE, which stands for "brief resolved unexplained events," and concluded that these phenomena are seldom related to an underlying medical issue. It replaces the previous term (which sounds far scarier): "apparent life-threatening events." According to the research team, a BRUE is transient and has no identifiable cause. Here are a few things that characterize this issue: A BRUE can happen to babies who are younger than a year old, it can cause irregular breathing, unresponsiveness and a change in muscle tone—and yes, it can cause a baby to turn blue for a few heart-stopping seconds. With a BRUE, the issue lasts less than a minute and resolves itself. "Infants probably do these things regularly and we don't know it," Ian Holzman, M.D., chief of newborn medicine at Mount Sinai Hospital in New York City, told Health Day. "I think that's the gist of it. This is something that's not a disease, not a sickness. It happens, and you don't have to get crazy about it." Researchers have determined that this issue is not related to SIDS (sudden infant death syndrome). Although it may be nothing, it's always safest to call 911 if you witness your baby turn blue or stop breathing. "Once [medical dispatchers] arrive, they will assess the baby and start emergency treatment should the baby still be blue. If your baby is no longer blue they can give recommendations as to how the baby should be transported for further evaluation. 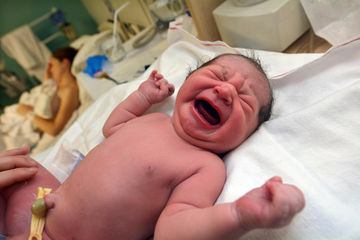 If the baby returns to normal color before the arrival of emergency medical services, the caregiver should still take the baby for medical attention, either with their primary physician or emergency department," Robert Sapien, M.D., who was on the research committee, said. Dr. Sapien also believes that parents should notify their baby's doctor after every BRUE. "Kids aren't born with a manual," Joel Tieder, M.D., a doctor at Seattle Children's Hospital, adds. "Sometimes infants do things that are normal, but parents don't know about them. It can be difficult for parents to distinguish normal newborn behavior from a sign of illness. It can also be difficult to determine the color blue with the human eye, particularly in poor lighting or with certain skin tones. My advice is that when in doubt, seek medical advice." Dr. Tieder also recommends having infant CPR training, which can help teach parents to identify life-threatening issues. "Turning blue can be very serious, especially when associated with cessation of breathing or normal heart function. Turning blue can also be normal in infants," Dr. Tieder says. "For example, it is normal for infants to have a blue appearance of the hands, feet, and the lips because of the way they shunt blood away from their extremities. Another example of a something quite common and normal that most parents don't know about are breath-holding spells. This is when babies get mad, cry, hold their breath, may turn colors, and then may pass out. These are scary episodes but not typically harmful and not a sign of an underlying illness. Your doctor or nurse practitioner can help determine if this is what your baby is experiencing or if it is something more serious."